Melissa Reich Will Get Your Home SOLD! We know you’re wondering what everyone in the neighborhood is going to decorate their houses with this fall! Well, look no further- we have done some research on the best design trends for this fall so that you can have the best looking house on the block! 1. Statement House Numbers. Nothing makes a house feel like a home more than eye-catching house numbers on the door or beside it to show that you’re proud of your home! 2. Muted and Subdued tones are in, while bright colors are out. When shopping for new decor this fall, opt for a maroon, dark brown, or dark green instead of the bright orange that people typically stick with to represent fall! 3. Incorporate white pumpkins. Instead of getting the traditional orange pumpkins this year, try getting a few white pumpkins, and adding some sweet calligraphy to them with a gold sharpie! White pumpkins add an unexpected and elegant twist! 4. Etch your pumpkins! Announce your address in style by cleverly etching your house number (or your initials or name) into a pumpkin. You can pile a combination of traditional and heirloom pumpkins on your front steps, and top with your etched design. Etching will leave an artful design on your pumpkin. The technique allows your pumpkin to last longer and is less messy than traditional carving. 5. Use Indian Corn. This is an excellent way to get the autumn feel while still keeping your palette earthy and natural. Pair it with a few autumn blooms, and some burlap, and you’ll have some excellent fall accents! Can’t wait to see all the fall decor emerging in the Summerset community! Check out some of these ideas on Pinterest for more inspiration, or even some DIY tutorials! We all know the feeling of lugging our fall and winter clothes out of the closet and wondering, “what was I thinking when I bought all of this stuff?” Well, this year at Summerset we are teaming up with Thriftique to do a clothing drive, and you can get rid of all those clothes you don’t have room for this year while supporting a good cause. The clothing drive will be held in the Community Center at Summerset from Saturday, September 16th from 9 am. to 4 pm., until Sunday, September 17th from 12 pm. to 4 pm. The clothes donated at the drive will then be sold at Thritique in Lawrenceville and the proceeds from that will be donated to the National Council of Jewish Women. This drive is open to Summerset residents only and is an awesome opportunity to give big to a great organization while making more room in your closet! Stop into the Community Center on September 17th and bring your unwanted clothing items to support an amazing cause! Selling your home is easy when you trust Melissa Reich to get the job done. Aside from being an expert on Summerset at Frick Park homes, Melissa has a database of qualified leads and exclusive social media channels to get your home sold, FAST! Just this past week, Melissa sold a home at 1319 Parkview Blvd in under a week, continuing her selling streak that includes every new construction home in Summerset over the past 12 years and over $110,000,000 worth of Summerset-only real estate. Any real estate agent will try to expose your listing to potential buyers, but few have access to as many quality leads as we do here at Summerset! The winning team of Melissa Reich and her resale partner Jill Portland offer direct access to over 5,000 qualified leads via targeted E-blasts. In addition to standout listings with professional photography on the MLS, Realtor.com, Zillow, Remax, Trulia and dedicated social media channels, your home will be featured on the summersetatfrickpark.com website with over 3,000 unique visitors each month. This team’s results speak for themselves. Let them handle your home sale, and get the results that you want, SOONER! Although it is tough to pick a favorite thing about Summerset at Frick Park, we love its central location. The neighborhood is conveniently located minutes from anywhere, which is especially great for all the awesome events going on around the city this summer. 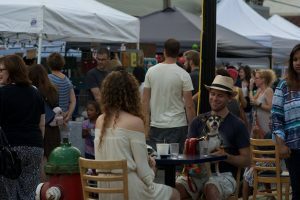 The Squirrel Hill Night Markets are some of our favorite evenings all season, and getting there from Summerset is a breeze. The annual tradition is back for another year, falling on June 17th, August 26th, and September 23rd from 6-10pm at Murray and Forbes Avenues. The free, outdoor street festival has something for the whole family: live music, over 100 market vendors and merchants, and games, activities, and crafts for the kids, and food served up by some of Pittsburgh’s best food trucks and your favorite Squirrel Hill restaurants. New to the markets this summer is the introduction of themes. June’s theme is “Americana,” featuring musical acts The Squirrel Hillbillies and Buffalo Rose. Backyard BBQ is the theme for August, paired nicely with classic rock by The Relics. Finally, the September night is styled after a Hawaiian Luau, complete with a performance by the Steel City Ukuleles and another awe-inspiring performance by the Samoan Fire Knife Dancers. If you’re still dreaming about the Mac ‘n Gold food truck’s cheesy goodness, or you love trying the local food trucks that come to Summerset on Thursdays, make sure to check out the Squirrel Hill Night Markets this summer and explore the communities right in our backyard. The people that live in Summerset at Frick Park are what make it a community, rather than just a neighborhood. We love getting the chance to gather together and strengthen friendships with our neighbors, and Food Truck Thursdays are a great opportunity to do just that. 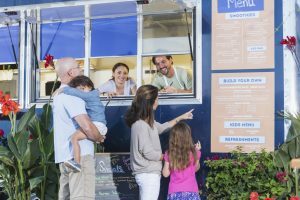 Thursday evenings, all summer long, come by the community pool to mingle with friends and neighbors and enjoy some of the best food trucks in the Pittsburgh area. Highlights from the first few Thursdays were local mac and cheesery, Mac ‘n Gold, purveyors of slow-cooked meats and comfort foods, Southside BBQ Company, and North Indian cuisine vendors, Billu’s Indian Grill. Week after week, great local food trucks will continue to come in. Keep your eyes on the Summerset at Frick Park Facebook page for event listings, and come down to the pool on Thursday evenings for incredible cuisines driven right into your neighborhood. Although the thunderstorms we’ve been having lately have us thinking about different kinds of severe weather, we all know the temperatures in the summer months can be sweltering. With these extremely high temperatures comes the increased risk of heat exhaustion and heat stroke. It’s important to know the warning signs and differences between the two and to have a plan in place to stay cool this summer. Heat exhaustion can occur as a result of high temperatures, especially when combined with high humidity and/or strenuous physical activity. Symptoms include faintness or dizziness, excessive sweating, cool, pale, or clammy skin, rapid and weak pulse, and muscle cramps. In the case of heat exhaustion, drink lots of water and get inside to air conditioning to cool the body off. If untreated, heat exhaustion can progress to heat stroke, which is much more serious. Heat stroke can occur if heat exhaustion is not promptly treated, and is a very serious life-threatening condition. 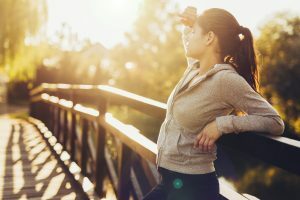 Symptoms progress from heat exhaustion: sweating stops, skin becomes red, hot, and dry, pulse becomes rapid and strong, and loss of consciousness can occur. In the case of these symptoms, seek immediate medical attention. Fortunately, if you’re paying attention, heat exhaustion is entirely preventable and can be stopped well before becoming more serious. One of the best ways to prevent heat exhaustion is to stay cool, and what better way to cool off than a refreshing swim? The Summerset at Frick Park community pool has opened just in time for some cool relief to hot summer temperatures! The community pool is outfitted with a children’s wading pool, a basketball court, playground, tables and chairs for picnics, and comfortable lounge chairs to relax in the sun or the shade. Stay safe this summer, and have a plan to stay cool before the temperatures skyrocket. Summerset at Frick Park is attractive for a lot of reasons. It’s a walking community, it’s award-winning, the homes are built with quality and style in mind, and as the old adage goes — it’s all about location, location, location. We’re minutes from the hustle of downtown, a short drive from the education hub of Oakland, and a stone’s throw from the technology startup boom of East Liberty. Not to mention all of the shopping and dining options that surround us — from the big box retailers in the Waterfront to the boutiques and eateries in Squirrel Hill and Shadyside. La Escuelita — a Pittsburgh-based Spanish language immersion school. La Escuelita is one of the city’s best and most creative early childhood language immersion programs that provides pedagogical excellence using the principles and philosophy of Emergent Curriculum. Studies show that exposing children to a second language at an early age enhances the part of the brain that processes language allowing them to understand the nuances of language more quickly than non-bilingual students. Don’t worry if you don’t speak any Spanish in the home — immersion programs are designed for English-only or non-Spanish speaking households. Environmental Charter School at Frick Park— a charter school whose aim is to educate each student to high academic learning standards using a themed curriculum that will foster knowledge, love of and respect for the environment and the will to preserve it for future generations. ECS is filled with a passionate and progressive group of educators who work to develop students into global thinkers with diverse perspectives. They don’t want to just graduate students. They are committed to building engaged thinkers using the platform of the environment and ecology to explore complex, diverse perspectives.